ECAP - An ECAP (Education and Career Action Plan) reflects a student’s current plan of coursework, career aspirations, and extended learning opportunities in order to develop the student’s individual academic and career goals. On February 25, 2008, the Arizona State Board of Education approved Education and Career Action Plans for all Arizona students grades 9-12 (R7-2-302.05). The Arizona Department of Education, Career and Technical Education is pleased to make AzCIS (Arizona Career Information System) available online to all Arizona residents. AzCIS is designed to provide educational, career, and occupational information to help students in making better-informed career and school choices. This resource is used in Tucson Unified for individual student ECAPs. See your school counselor for more information. Tucson Unified complies with all state mandates regarding ECAP. 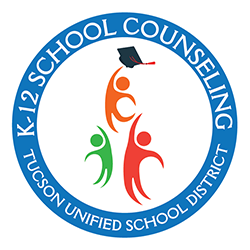 These standards, along with the American School Counselor Association National Standards, are the basis for career and college readiness in TUSD.